When you start the process of looking for a lawn mower to buy, it is important that you choose one with the right features and practical specifications for your outside space (e.g. sufficient power and size etc.). So having gone through that criteria and you have decided on the highly regarded Greenworks 25022 and 25112 yet can not decipher as to which one to choose (as granted they are actually fairly similar e.g. price wise they both come in at somewhere around the $180 to $220 mark and they’re both similarly sized, so you are right to investigate what separates them further) then you are in the right place. Where this brief & objective review account takes to comparing them both -- we will take look at both their similarities as well as their differences so that you can understand and determine which one may suit you better and your specific needs & preferences -- overall, finding which one offers you the best value. Both of the mowers come with a simple push button ‘start’ -- and a four years consumer warranty to back them for both parts and labour (generally regarded as being twice that of the industry standard). Moreover, they also both feature 7-inch front tires and 10-inch back tires (so pretty much the same mobility mechanism). They also both have the ability to back up the grass to a grass collector as it comes out or to side discharge or to mulch. Just to note further, they are also designed to have seven cutting positions and use one blade. And of course like all GreenWorks machines they like to stress a "ZERO carbon footprint", so getting a GreenWorks machine is pretty much like doing your 'good deed' for a month (well I reckon so any how). One of the first differences you should note is that with the 25022 and the 25112 -- is that the 25022 model cuts a little bit lower i.e closer to the ground. Its cutting range is from 1.5 to 3.75 inches, whereas with the 25112 model it ranges from approximately 1.75 to 3.75 inches. As well as this, the 25022 is a little weightier -- making it slightly more house to manoeuvre but in reality it’s not enough for you to notice in most situations -- but it is 5lbs heavier weighing 59lbs rather than the 25112's 54lbs. If you prefer your metric system, that equals around 26.76kg instead of 24.49 kg. (The difference in power is noted further down). 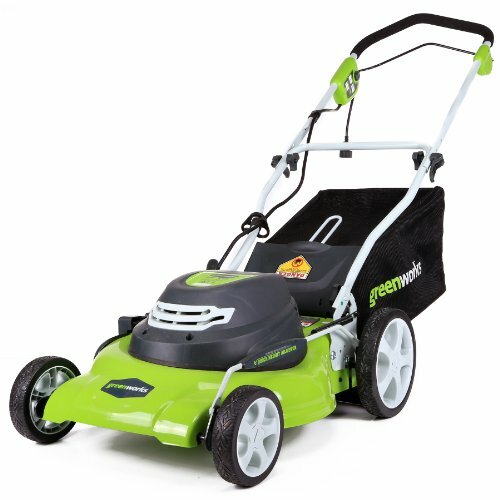 The reviews of the two mowers are both very positive & have nothing but good things to say about the GreenWorks lawn mowers in general. The 25022 will pretty much receive (or be approaching) 5 out of 5 on most 'testing' websites such as Mowers Direct and the 25112 similarly receives very good testimonials also (although perhaps not to the same extent). Check out sites such as Amazon.com where they list hundreds of reviews and is personal feedback from people who have actually owned the lawn mowers, they will know better than anyone -- how good each one is respectively. Consumers state that both mowers are light weight, easy to use, and relatively quiet (well compared to most other competing lawn mowers at the price any how). On the other side of the coin, many of the consumers did tend to find that the cord got in the way sometimes and this was a bit of a irritant, but that is generally the case with all mains electric lawnmowers in fairness. Hence, if you’re used to a gas or cordless mower then these electric mowers may take a fair bit of getting used to. Conclusion: Which should you go for the GreenWorks 25022 or the 25112? As established, the main difference between the two mowers really is the size of the cut. The 25022 has a 20-inch rotation, whereas the 25112 has a 21-inch. Both mowers therefore have a good cutting dimension but the 25112 is a little bit larger. If you have a bigger outdoor space, then you should probably go for that one, the 25112. It is also more capable of dealing with long(er) grass because its motor is slightly more powerful (but only fairly marginally, you wouldn't really notice it from using one to the next) -- the 25112 has a 13 Amp motor as opposed to the 12 Amp motor in the 25022. If the customer reviews are anything to go by, then you will be certainly happy with either mower and it just comes down to whether you want to pay the extra $20 difference between the mowers in order to get the slightly wider cut and grass that is cut of a ¼ of an inch lower. 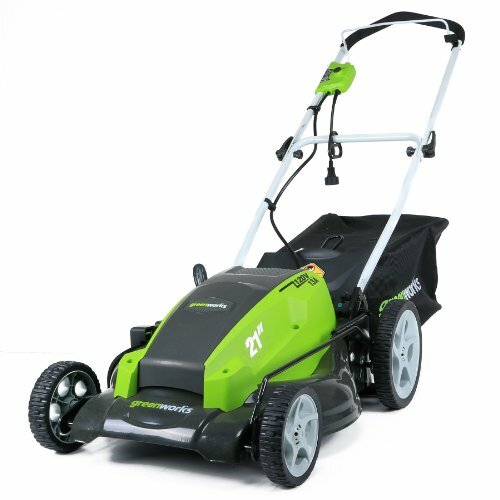 If your lawn is uneven or you have a slope on your garden then opt for the lighter and therefore easier to steer 25022 model; if you have a lawn like a putting green then the 25112 will allow you to cut it that little bit shorter. Please do let me know which one you have opted for and why in the comments below and why & if you have any questions, comments or remarks regarding either the comparison article of '25022 versus 25112' or about either of the models specifically (e.g. 25022's mechanical specifications & features) then please do not hesitate to make them in the comments section below also and I will be sure to get back to you as soon as possible. The last paragraph of this article contradicts what was said earlier in the article - in the last paragraph is says that the 25022 is lighter, whereas before the article said it was heavier; it also says that the 25112 cuts closer to the ground, whereas before it said that the 25022 cut closer!